Do Negative Ads Make A Difference? 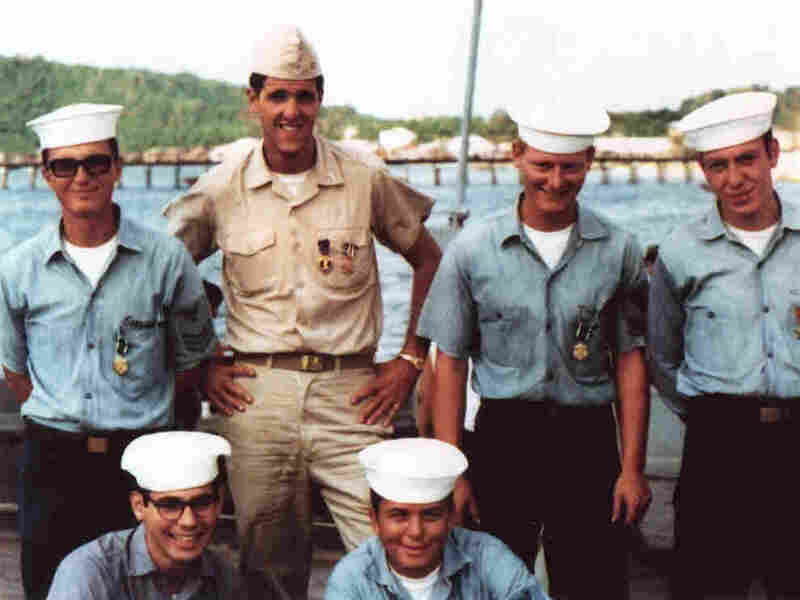 Political Scientists Say Not So Much : It's All Politics Blistering political ads like the swift boat attacks on John Kerry in 2004 may not be as decisive as politicians think. Political scientists say if voters already know a candidate, negative ads don't have much of an impact. Future U.S. senator and presidential candidate John Kerry poses with crewmates during the Vietnam War in this file photo. An attack on his service by a group calling itself the Swift Boat Veterans for Truth is remembered as a turning point in the 2004 election. But political scientists say negative ads might not be that effective. Pundits and commentators are forecasting that this fall's general election will see an avalanche of negative advertising. But as voters gird for the onslaught, political scientists are asking a different question: Will it matter? When the Supreme Court lifted restrictions on private advertising in elections, superPACs supporting President Obama and the most likely Republican nominee, former Massachusetts Gov. Mitt Romney, promised to unleash negative attacks on the other side. But a growing body of political science research suggests that although negative advertisements are widely seen to be decisive campaign weapons, those ads are much less effective than most people believe. One comprehensive analysis by researchers at Rutgers and George Washington University concluded: "All told, the research literature does not bear out the idea that negative campaigning is an effective means of winning votes, even though it tends to be more memorable and stimulate knowledge about the campaign. Nor is there any reliable evidence that negative campaigning depresses voter turnout." Most people, of course, can recall nasty ad campaigns that shaped an election's outcome. Campaigns such as the Willie Horton ad in 1988, the swift boat ads in 2004 or the intense negativity in the early GOP primaries this year all suggest that negative ads are powerful. But empirical studies, which seek to measure the effectiveness of ads across campaigns, suggest that these campaigns may be most effective when voters are unfamiliar with a candidate — which won't happen this fall. When voters know a candidate fairly well, the ads don't usually do much. "When voters are confronted with inconvenient facts, it is oftentimes difficult to persuade them that those facts are, in fact, facts," said George Washington political scientist John Sides. "When supporters of President Obama see negative information about Obama, they don't think it is true. To the extent it is true, they find ways to explain it or rationalize it — they discount it." The same, of course, will be true for the GOP nominee come fall. Sides argues that candidates stick with negative ads in part because they're locked in an arms race and are unwilling to unilaterally disarm. Candidates who think they'll be attacked by negative ads believe they need to return fire. But Sides also argues that there could be a potential conflict of interest among people who advise candidates. "A concern that I have," he said, "is that a lot of our accounts and understanding about the effectiveness of advertising comes from people who have a professional interest in selling advertising to candidates, and who don't have the need or the time or the inclination to do a lot of rigorous research into the decisions they're making."